Barn Bag® Pelleted Low Starch Hay and Pasture Balancer. The Barn Bag® Fibre Balancer is a low calorie and low starch equine supplement that provides the horse a daily fixed amount of important vitamins, minerals, amino acids, and fatty acids. These nutrients are often lacking in the equine forage diet. 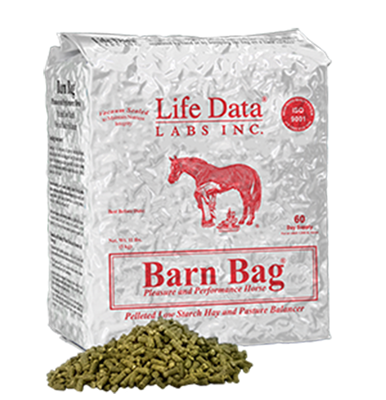 Barn Bag® is a pelleted concentrated nutrient source that increases the feed utilization of the hay and pasture to provide a balanced diet.